A.B.C. Photography (Homepage) wrote: Wonderful soft colors and the shallow DOF is just perfect! Gromitch (Homepage) wrote: Very nice colour and DOF! Waterdrops are amazing!!!! Zlatinka (Homepage) wrote: I was surfing through your whole gallery, just watching amazed but when I saw this photograph I simply have to comment it. Congratulations! Tim Corbeel (Homepage) wrote: Fantastic colors and composition! LGB (Homepage) wrote: No words. Absolutely gorgeous! Marie (Homepage) wrote: fabuleux, qu'est-ce que c'est beau !!! mbecher (Homepage) wrote: Great. I love the contrast. On the one side you have cool colors in a quiet background, on the other side there is a lot of action (or readiness) on the subject. Suitable for a large print. Well done. lusyamcoga (Homepage) wrote: Woauhhh ! alors là !!! je découvre ton blog et j'en prends plein les yeux ! une vraie merveille ton blog, il file direct dans mes favoris ! tes macros sont empreintes d'une beauté à couper le souffle ! Scarabaeus (Homepage) wrote: Stunning detail, lovely colours too. ana lúcia (Homepage) wrote: Masterful in every way. Kyrre Lien (Homepage) wrote: This was just stunning! Very nice colours and the focus is perfect. Very nice estetic as well as technical. Great! Frans Erasmie (Homepage) wrote: Fantastic image, great gallery! Cerstin (Homepage) wrote: You have done it again, wow superb details (waterdrops, ...), wonderful rosa mood. Andrés (Homepage) wrote: Superb macro Paolo. The colours are also beautiful. Calusarus (Homepage) wrote: What a great macro. Congratulations. Terry H. (Homepage) wrote: Insects on flowers one of my favorite type of shots in photography. Awesome and well done! 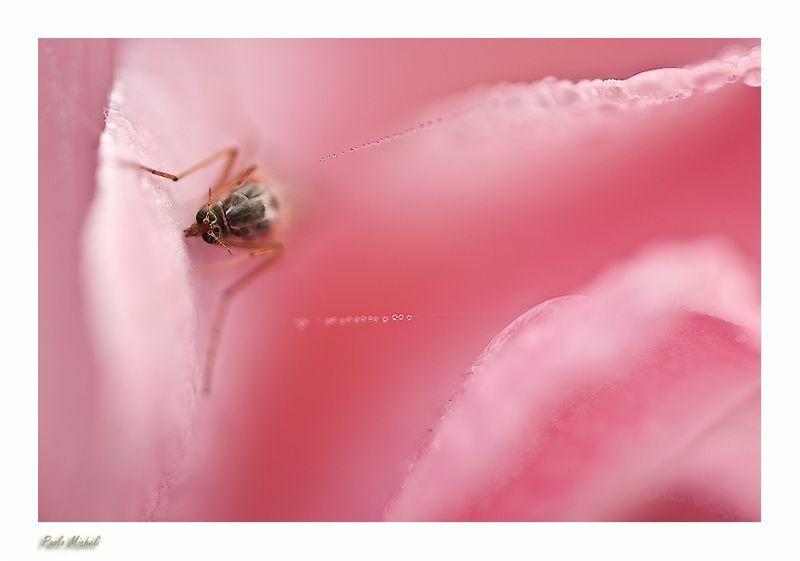 martie (Homepage) wrote: Beautiful macro - and such soft, delicate shades of pink. Mike (Homepage) wrote: beautiful color and dof. superb focus. Arjan - PlasticDaisy (Homepage) wrote: Amazing!! Wow this is an outstanding composition! Love those tiny drops of water! Ovidiu (Homepage) wrote: Wonderful macro! I love the colors! AbsolutelyN (Homepage) wrote: Superb image, love the extremely shallow dof. Laurie (Homepage) wrote: Spectacular details. So fine. Lovely colors too. John Maslowski (Homepage) wrote: Wow is this a gorgeous macro shot. The colors are fascinating and the DOF is exceptional. Excellent in every way! Vink (Homepage) wrote: A very great macro ! you're an artist ! Marcie (Homepage) wrote: Stunning detail and color. Love the soft textures. WOW! roentarre (Homepage) wrote: Stunning in deed. Wow, what a great pink colour! beanow (Homepage) wrote: The nice pink tone of this picture! LGB (Homepage) wrote: So beautiful! Zing (Homepage) wrote: Awesome macro, wonderful colours and dof. Al (Homepage) wrote: Love the silkiness of this image. Bill Ault (Homepage) wrote: Spectacular - the combination of soft focus and the colour really works nicely. Craig (Homepage) wrote: Wonderful colour ond DOF, very nice indeed. Thanks for visiting my blog too. Xavier (Homepage) wrote: I love the colors and the soft focus in this one! You've got some amazing macro shots in your site! jo (Homepage) wrote: I love how everything fades in and out of focus, like some candy colored dream with a bite!! Will Williams (Homepage) wrote: Such soft tones and superb sharp details. Rachael (Homepage) wrote: Soft pink & nature working with nature. Stunning. cako (Homepage) wrote: Another excellent macro shot. Absolutely great ! grant (Homepage) wrote: beauty and the beast is exactly right - that beautiful lush pink, and that disgusting, larger-than-life fly... very well done! Elaine- (Homepage) wrote: the pink seems like the perfect color pink, like a summer blouse i had when i was young, but that BUG, UGH lol cool shot tho! Robin (Homepage) wrote: So soft and beautiful, thanks for visiting my blog.